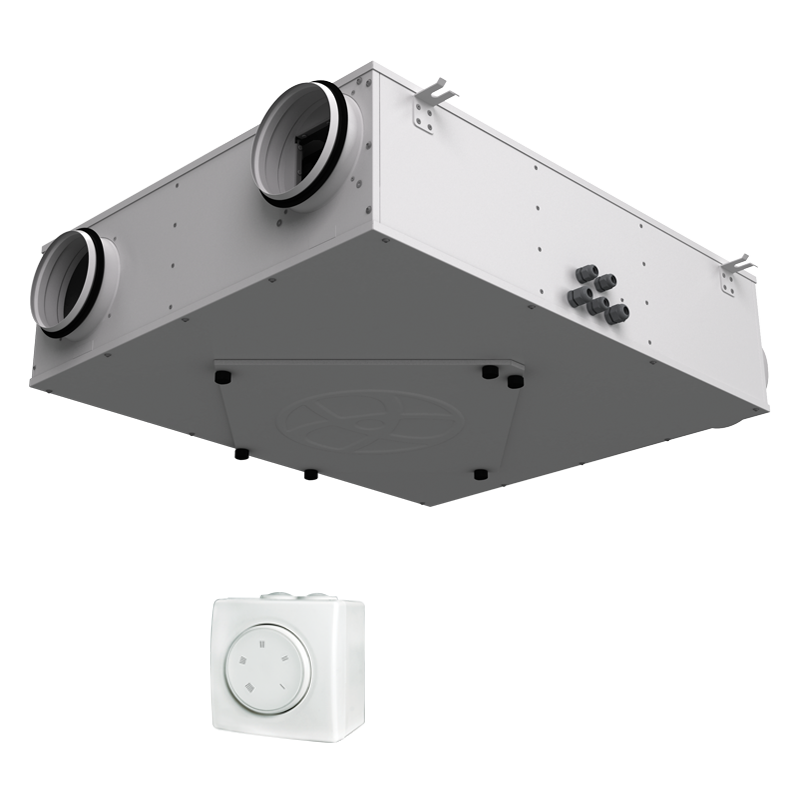 Ceiling suspended air handling unit with energy recovery, Maximum air capacity up to 400 m³/h. Air handling unit for efficient supply and exhaust ventilation in flats, houses, cottages and other buildings.Heat and humidity recovery minimizes ventilation heat losses during cold season and reduce air conditioner load during hot season.Controllable air exchange ensures the best suitable indoor microclimate.Compatible with round Ø100 or 150 mm air ducts. The casing is made of polymer coated steel panels, internally heat- and sound-insulated with 5 mm polyurethane foam.The bottom service panel provides easy access for maintenance of the filters and the heat exchanger.The spigots for connection to the air ducts are located at the sides of the unit and are rubbed sealed for airtight connection to the air ducts.The mounting brackets on the casing ensure easy installation under the ceiling. Asynchronous motors are used for air supply and exhaust.Komfort ERV D150 S20 and Komfort ERV D250 S20 are equipped with a centrifugal impeller with forward curved blades and Komfort ERV D350 S20 is equipped with a centrifugal impeller with backward curved blades.Integrated overheating protection with automatic restart.Ball bearings for longer service life.Dynamically balanced impellers.Featured with reliable and low-noise operation. Due to the low casing height the unit is the ideal solution for mounting in the limited space behind the suspended ceiling.The installation place must be easily accessible for servicing. The unit is equipped with a plate cross-flow enthalpy heat exchanger made of polymerised cellulose.Energy recovery is based on heat and humidity transfer from extract to intake air flow through the heat exchanger plates. The air streams remain separated.Most of extract air heat energy is transferred to the intake air flow. Heat recovery reduces heat losses in cold seasons. In summer the heat exchanger performs reverse and cools down the supply air by transferring most of its coolness to hot intake air. This reduces load on air conditioners in ventilated premises.A frost protection system is used to prevent the heat exchanger freezing during cold seasons. In case of a heat exchanger freezing danger communicated by the temperature sensor the supply fan stops to let warm extract air heat up the heat exchanger surface. After a freezing danger is over the supply fan turns on and the unit reverts to the normal operation mode. Two built-in panel G4 and F8 filters provide efficient supply air filtration.The extract air is filtered with a panel G4 filter. Integrated control system based on triac speed controller.